Disney has taken a great leap forward in helping its guests meet Star Wars weekends characters with little wait, but a lot of money. 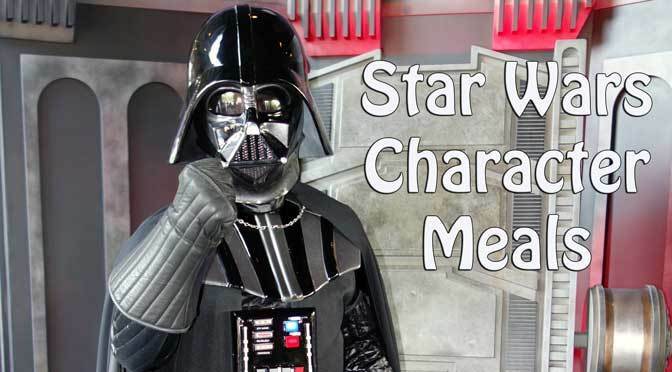 From May 4th through June 14 guests will be allowed to enjoy character dining with some of Star Wars greatest characters as well as some Disney pals in their Star Wars finest. Reserved Parade viewing with snacks and soft drinks/water. ONE priority seating show at Theater of the Stars to be booked the morning of your package at Min and Bills starting at 10:00am. (First come first served). Both packages have 1 day cancellation policy. The Feel the Force Premium Package occurs every Friday, Saturday and Sunday from May 15 to June 14, 2014. Legends of the Force: Star Wars Celebrity Motorcade viewing experience happens from 10:30 AM to 11:30 noon with the motorcade starting at 11:00 AM. Symphony in the Stars fireworks dessert party takes place from 9:00 PM to 10:00 PM with the firework shows beginning at approximately 9:30 PM (9:45PM on weekend ONE). To check in for this event, please visit Min and Bill’s Dockside Diner starting at 10:00 AM. Guests will receive a wristband during the motorcade viewing that will allow entry into the evening fireworks dessert party. If you are unable to attend the motorcade viewing, please check in at Min and Bill’s Dockside Diner starting at 8:30 PM. Beverages include soda, water, tea and coffee. The fireworks dessert party includes a specialty beverage with an alcoholic option. Guests must be 21 years of age or older to consume alcoholic beverages. The Jedi Mickey’s Star Wars Dine at Hollywood and Vine DINNER (Breakfast and Lunch will continue to be Disney Jr Characters) will offer Star Wars fans the opportunity to meet Jedi Mickey, Princess Leia Minnie, Chip n Dale as Ewoks, Donald as a Stormtrooper and Goofy as “Darth Goofy.” These are the exact same costumes the characters wear in the park, but there will be no waiting in the sun and you’ll be guaranteed to meet them all! The cost of this Star Wars character meal is $55.99 $57.99 for adults 10 and over and $32.99 $34.99 for children 3 to 9 years of age. If you’d like to make it a Fantasmic! dining package the cost is slightly more at $59.99 for adults and $36.99 for children. The meal will also include a digital download of Ewok Chip n Dale. The meal will begin serving at 4:15 daily and close with the park. You can book this reservation here. The other great Star Wars character dining experience is known as the Star Wars Dine-In Galactic BREAKFAST (The other meals are still standard ala carte dining with no characters). The characters for this meal include Darth Vader and Stormtroopers, Boba Fett, Greedo and Jawas (ready to trade with you). There will be no sci-fi movie trailers, instead they will offer clips from Star Wars movies. The cost is $47.99 $49.99 for adults 10 and up and $29.99 $31.99 for children 3 to 9 years of age. Reservations for this meal are accepted from 8:00 am until 12:00 noon. You can reserve this meal here. For those using the Disney Dining Plan, each meal requires TWO Disney Dining plan credits. Disney recommends you call 407 WDW DINE, but I called 407-WDW-CREW (Pirate :) you could also try 407 WDW PLAY and requested dining reservations and the lady knew exactly what I was looking for. The Feel the Force Package cannot currently be booked online or using Disney app. A credit card is required for guarantee and the typical $10 per person cancellation charge will apply if you fail to cancel by midnight the night before your meal. Make those reservations now, these meals are sure to fill up quickly! Hope to see you there. Thank you sooo much for your new update!! I haven’t see this info anywhere on WDW site but I called dining this morning and booked my package. Did this last year and really enjoyed it so this year did the upgrade package with seating for Stars of the Saga. Thanks again!! Thanks for the info. We arrive on June 15. I was actually not looking forward to overlapping a day with starters because I was unsure how it would affect crowds, but now that my son gets to have a character breakfast with Star Wars characters it is all worth it. I would have been completely out of the loop without you. Anyone know what the breakfast menu is? Kenny, Have you heard how the characters will be set up for the breakfast? Wondering if they will roam like other character meals, it just feels weird to me if Vadar, Fett, etc are wandering from table to table. (not that I would complain, of course. The time saved from waiting in line later is worth it). I booked them both (can’t wait, it’s the first time we have made it for a Star Wars weekend). Haven’t heard, but here’s my guess. Photo op with Darth Vader and the rest will roam the room. I reserved the breakfast at Dine-In for the 5th and was told that Darth Goofy and the Disney characters would be in attendance. Love the Cast Members, but they are grossly under informed. So we already had a Fantasmic Package booked at Hollywood and Vine for during our May trip. The reservation automatically switched over to this new dinner, but that doesn’t really make me happy since it is now 2 credits and we aren’t big Star Wars fans! Any info on what the dinner will be? Better be good food for 2 credits since the character experience doesn’t matter to us much…except may be interesting to see! I called Disney and they said they would be calling all the people this affected to see is they want to keep the new experience or offer an alternative meal for 1 credit. Any thoughts on what they may do? I am inclined to keep it and end up paying extra for another dinner because we want the Fantasmic seats and don’t think we can FP it this late in the game, but was wondering if you have heard of his happening in the past? I doubt Dinner would be significantly different than usual, just some Star Wars names probably. They would probably have to switch to 50’s Prime Time. You could easily arrive just a few minutes before the second Fantasmic and walk right in though. Any ideas on what type of food will be offered for breakfast? Is it buffet? It’s plated. Pastry, Yogurt, Basic food plates to choose from. Eggs and bacon, waffles etc. Thanks for at info! Will it be all you can eat like at Akershus and Ohana? Was on hold forever like 25 minutes but got a table for the dinner, went ahead and paid the little extra for the fantasmic package! Hopefully it’ll make things flow easier. We’re actually missing Star Wars weekends, always wanted to see the characters though. These are the ones I wanted to meet too! So excited for chip and dale! Super excited for this. Thanks Kenny for the heads up and early notice. I wouldn’t have known, or would have found out to late if not for you. Thanks foe all you do. Was on hold for 25 minutes, but I got a reservation! It’s going to be so worth it! We got in! Thank you so much for the information. Looks like they are filling very fast. We had to go for Friday as the Sat and Sunday meals were already filled the weekend we wanted to go. Just booked this for May 12, 2014. Called and it is actually from May 4th to June 15th. Isn’t that what I posted in the article? Thanks for the heads up! So glad I started following you and got your app! We got the dinner for the two of us during our trip!! Pricey – and did not see if you noted it, but it is Two Table Service credits. I am going to pay OOP, but thought I would let your fans know. I’ll update the post, but the 2 DDP is for EACH meal? If that is the case, you’d come out better at Breakfast going Out of Pocket for sure. Thanks Amy! I only booked dinner and the CM ran through the policies (as they always do) and one of them was 2 Table Service Credits. I Repeated it back to her and she said, “Yes, since this is considered a special meal it will be 2 Table Service”. I did not think to ask about breakfast for you. I was on hold forever and then tried the second number. 10 minutes later, done! Thank you! Oh, of course! i wish I had known about this before I booked our flights, we would have tried to arrive earlier on that first Friday to make dinner. But Saturday will work too! any chance this will be added to all star wars weekends as we are going to be there the first weekend? Sounds awesome to me! I’d do it. so the breakfast is at the sci-fi? not that it matters because I can’t go … Disney please add this to the full time lineup! was not sure where else to post this but…we are going to be at WDW this year (2016) around the usual starting of Star wars weekends. We are desperately trying to find out if they will have the Galactic Sci-Fi Breakfast again? Have you heard anything as of yet?